Each year certain vegetables and flowering plants are chosen for their reliable performance under a broad range of growing conditions. They are good choices for a beautiful, successful garden. This is a guide about all-American garden selections. Among all of the new cultivars introduced each year, All-American Selection (AAS) winners are selected based on their performance in test garden and greenhouse trials around the country. If you're looking for flowers that have been 'tested nationally and proven locally' and deemed reliable over a broad range of growing conditions, check out these AAS winning flowers for 2010. 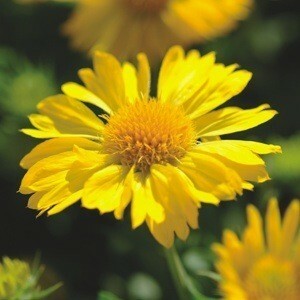 Gaillardia 'Mesa Yellow' is the first hybrid blanket flower bred for compact growth and prolific flowering. The 3-inch daisy-like flowers offer a superior presentation of color, which blooms early and continues throughout the summer. The flowers are great for cutting and attract butterflies when left on the plants. The seed cones attract birds in the fall. Mature plants grow into 2 foot tall mounds and prefer a sunny location. A neat mounding habit also makes them ideal for small garden spaces and in containers, when planted near the outside edge they will cascade down the sides. 'Mesa Yellow' plants proved to be wind and rain resistant, and relatively maintenance-free. Gardeners will find them available as both seed and plants. Recommended spacing 12-18 inches. Unique qualities: Mounding habit. Does not get tall, loose, and floppy. First F1 Gaillardia from seed. 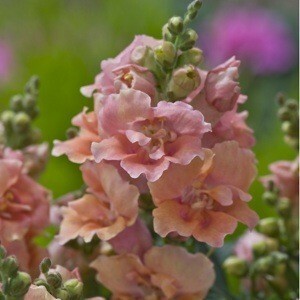 Snapdragon 'Twinny Peach' gets its name from its unique double-flowered form. Another unique quality is its blend of peach tone colors-soft shades of peach, yellow and light orange. No other snapdragon offers this range of colors. 'Twinny Peach' produces abundant 12-inch flower spikes in full sun, which are excellent for cutting. These annuals continue to flower all season with little care and exhibited good heat tolerance in the AAS Trials. Because they are quite resistant to weather, they can be grown in places other snapdragons cannot. Gardeners will find them available as both seed and plants. Unique qualities: First double flowered snapdragon with compact habit. Unique color. The 'Zahara Starlight Rose' is an old-fashioned flower with a stunning new color twist, and exceptional resistance to heat, drought, and humidity. Because of these outstanding qualities, it was planted for the Beijing Olympics. The striking 2 inch bicolor flowers are white with rose-colored centers and provide generous color all season, and they are attractive to bees and butterflies. 'Zahara Starlight Rose' is very easy to grow. It's the perfect plant for the novice or experienced gardener because it offers maximum blooms with minimum care. It is resistant to leaf spot and mildew, which can plague many zinnias. In full sun, mature plants grow about 12 to 14 inches tall and wide, large enough to make a bold statement in containers or patio urns. 'Zahara Starlight Rose' will be available to gardeners as either seed or plants. Unique qualities: First rose and white bicolor zinnia, with disease resistance. 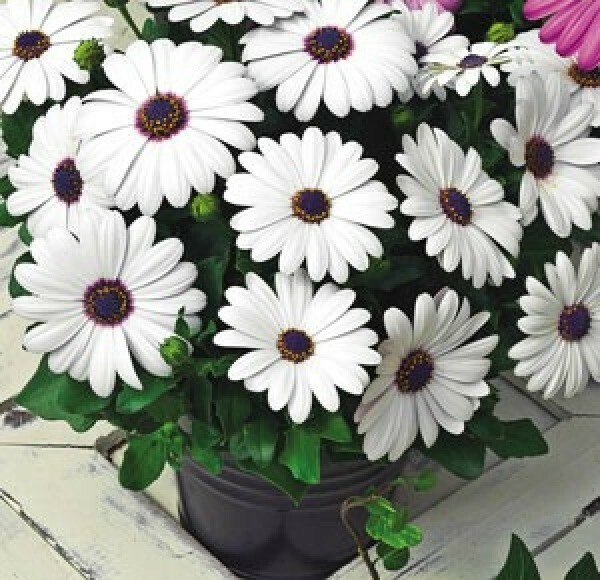 Pure white daisy flowers with blue centers are the main attraction for 'Asti White.' The large blooms, 2 to 2-1/2 inches across are borne on stems that gracefully wave in the wind, and the thick fleshy leaves makes this a preferred annual for dry conditions. 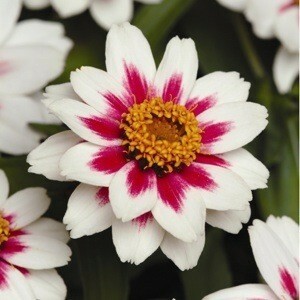 Originally, from South Africa, 'Asti White' is the first white Osteospermum, or Cape Daisy, propagated from seed. Unlike other daisies from this region, 'Asti White' flowers remain open under overcast skies. The 'Asti White' will bloom and recover nicely despite a slight frost, so they can be planted several weeks earlier than other tender annuals. That said, the plants still need 17 weeks from seed to flowering, so gardeners with a short growing season will either need to purchase bedding plants or start seeds early indoors. 'Asti White' can be planted in the spring or fall, in a sunny site with well-drained soil, or are well-suited to containers 6-inches or larger. Plants reach a uniform height and corresponding width of around 17 to 20 inches. Unique qualities: A perennial subshrub in its native Africa, Asti White can be grown as an annual in North America. Soil: Thick fleshly leaves allow it to tolerate dryer soil conditions. Length of time from sowing seed to flower: 17 weeks from seed to flower. Gardeners with shorter seasons will want to look for bedding plants at stores, or start them early indoors. The sunny gold faces of Skippy XL Plum-Gold are sure to charm anyone glancing their way. Their faces are uniquely designed with plum shades surrounding the golden centers, which contain radiating black lines affectionately called whiskers. The blooms are small, about 1-1/2 inches, but highly animated. The fact that the prolific number of blooms produced more than makes up for their small size, is one reason 'Skippy XL Plum-Gold' won the AAS Award. In Northern zones, expect plants to bloom from spring to mid-summer. 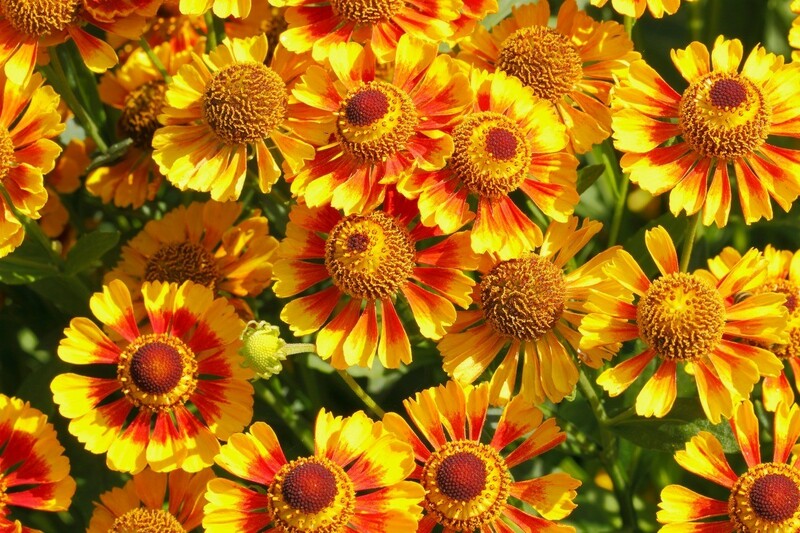 In the South, planting them in the fall may provide you with a perennial plant whose cheerful golden faces delight you in the garden all winter long. 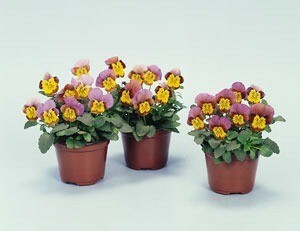 Their petite size of 6 to 8 inches tall and wide, make them highly desirable as companions in containers or widow boxes. Look for both seeds and bedding plants at local nurseries and in garden centers this spring and fall. This miniature eggplant is a smaller-sized plant that produces abundant finger-sized clusters, bearing 3 to 6 fruits each. 'Hansel' is an early-maturing plant, taking about 55 days from transplanting into warm soil to harvest-around 10 days earlier than its closest competition. 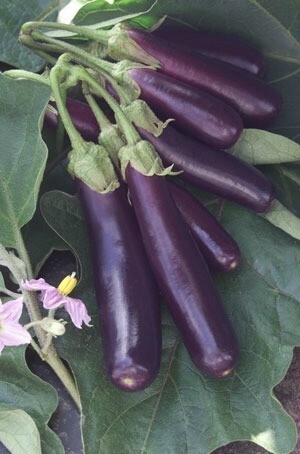 If left on the plant, the plant's 3-inch fruits will grow up to 10 inches in size, yet remain tender and non-bitter, unlike other eggplants. This trait offers gardeners the flexibility to take a much-needed vacation during the summer months without fear of losing the harvest in its prime. For patio gardeners or those with small spaces, 'Hansel' has an compact, upright growing habit ideally suited for containers or vertical gardening. 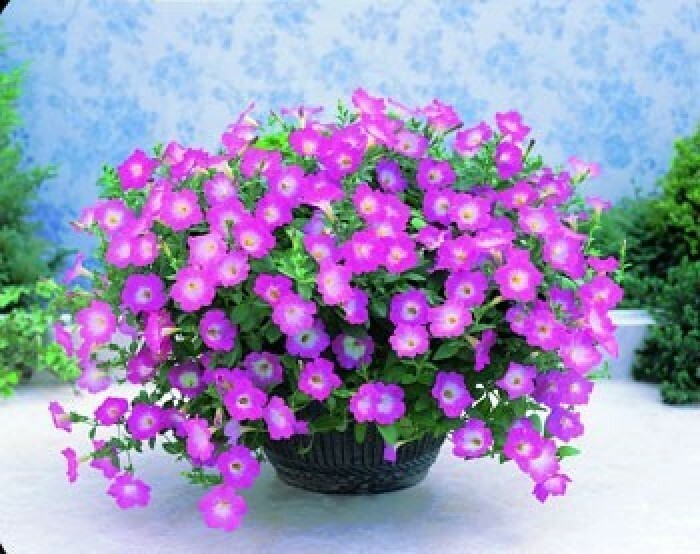 'Hansel' will be available this spring as both seed and young bedding plants. Fruit size: Can be harvested at all lengths from 3" to 10"
Unique qualities: Miniature plant. Clusters of tender sweet fruit with few seeds, early crop. Length of time from transplanting to harvest: 55 days; harvest in mid-summer to late summer. The All-American Selections for 2007. In 1932, a seed producer named W. Ray Hastings proposed the idea of All-American Selections as a way for home gardeners to learn which new varieties of vegetables and flowers are truly improved each year.